You Can Join The Revolution Courtesy Of Phil’s Picks! AEG Live is bringing another new music festival to audiences in the northeast. 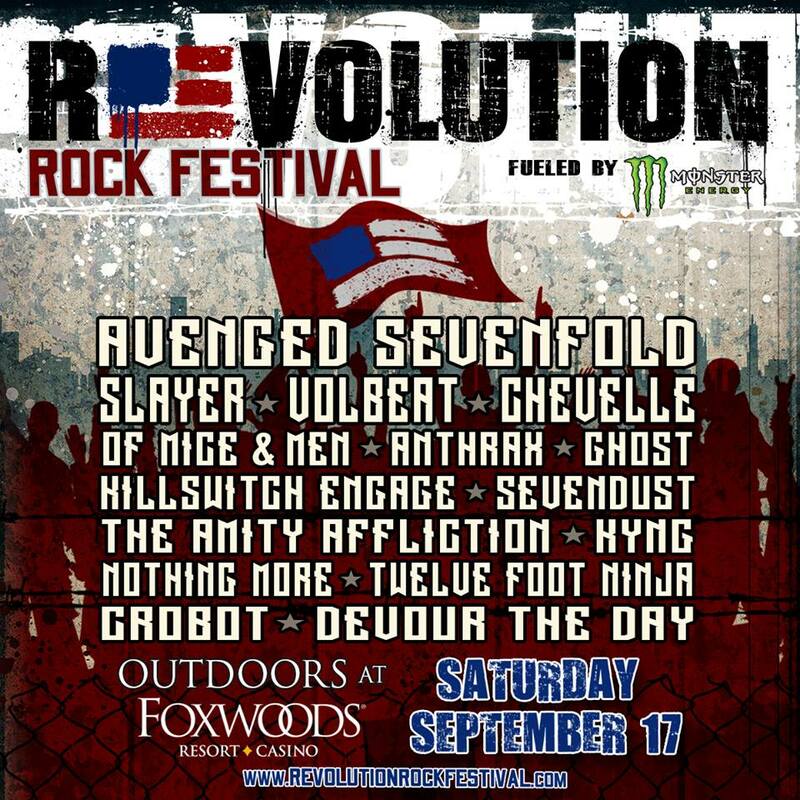 This fall, AEG Live will debut the new music festival, the Revolution Rock Festival. The festival, fueled by Monster Energy, will be held Saturday, September 17th outdoors at Foxwoods Resort Casino in Mashantucket, CT. And Phil’s Picks is giving YOU the readers the chance to win a pair of tickets to the one-day festival. All you have to do is message Phil’s Picks at http://www.facebook.com/philspicks, telling me who your favorite band on the bill is and favorite song from that band. On Friday, August 5th I will pull the lucky winner’s name. From there, the winner’s name will be sent to my contact, who will then put the winner’s name in him/her. Entrants should be reminded that this does not include travel, hotel, or food. This is only for admission to the festival. The lineup for the inaugural festival includes: Avenged Sevenfold, Slayer, Volbeat, Chevelle, Of Mice & Men, Anthrax, Ghost, Killswitch Engage, Sevendust, The Amity Affliction, KYNG, Nothing More, Twelve Foot Ninja, Crobot, and Devour The Day. To keep up with the latest sports and entertainment news and reviews, go online tohttp://www.facebook.com/philspicks and “Like” it. Fans can always keep up with the latest sports and entertainment news and reviews in the Phil’s Picks blog athttps://philspicks.wordpress.com. Specially priced pre-sale tickets go on sale this Wednesday, June 8th at 10am EDT. The pre-sale will run through this Friday, June 10th at 9:59am EDT. They can be purchased online at http://www.RevolutionRockFestival.com. Organizers have made a password for the special pre-sale available online only through the festival’s social media pages. The public on-sale for tickets begins Friday, June 10th at 10am EDT. Pricing for both pre-sale and public sale tickets is noted in full below. A very limited number of Foxwoods Resort Casino VIP Hotel packages for two and four individuals will be available online with regular admission tickets. They will include: VIP Lounge Access, hotel stay for Friday and Saturday night, and a $25 merchandise voucher for each individual. 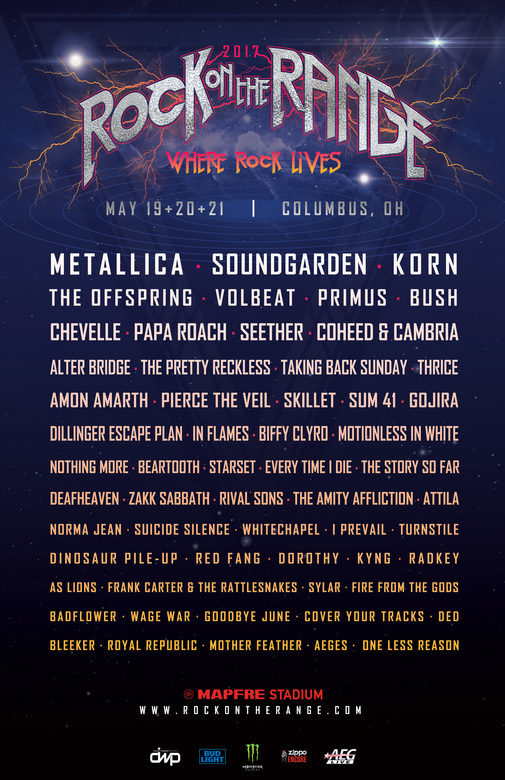 More information on the VIP packages is available online at http://www.RevolutionRockFestival.com. An equally limited number of discounted ticket 4-packs will be available for active military personnel through the festival’s partner GovX. The lineup for the 2016 Houston Open Air Festival has officially been announced. 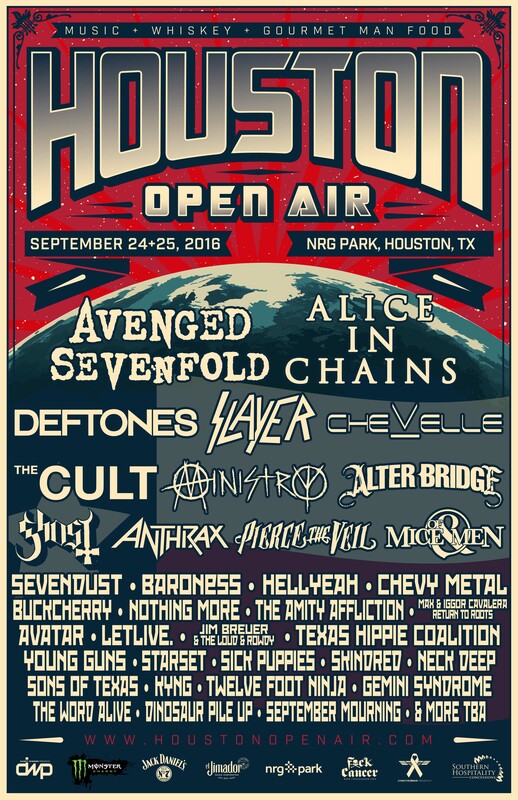 Organizers with the Houston Open Air Festival have revealed the lineup for the 2016 Houston Open Air Festival. The lineup will feature 35 bands over two days. That list includes: Deftones, Slayer,Chevelle, The Cult, Ministry, Alter Bridge, Ghost, Anthrax, Pierce The Veil, Of Mice & Men, Sevendust, Baroness, Hellyeah, Chevy Metal, Buckcherry, Nothing More, The Amity Affliction, Max & Iggor Cavalera: Return To Roots, Avatar, letlive., Jim Breuer and the Loud & Rowdy, Texas Hippie Coalition, Young Guns, Starset, Sick Puppies, Skindred, Neck Deep, Sons Of Texas, KYNG, Twelve Foot Ninja, Gemini Syndrome, The Word Alive, Dinosaur Pile Up, September Mourning, and more. Avenged Sevenfold and Alice in Chains have been named as the festival’s headliners. A rolling discounted Early Bird pre-sale for Weekend General Admission tickets begins this Tuesday, May 17th at 12pm CDT/1pm EDT. A very limited quantity of tickets will be available during this pre-sale. They can be purchased online at http://www.HoustonOpenAir.com and will only be available while supplies last. Their prices are noted below. VIP weekend tickets will also be available at a cost of $234.50. Public on-sale tickets will go on sale Friday, May 20th at 12pm CDT/1pm EDT. They will also be available for purchase online at http://www.HoustonOpenAir.com. Their prices are listed below. VIP tickets include: VIP entrance lanes into venue, access to VIP-only area featuring dedicated bar, beverage and food options (for additional purchase), VIP-only viewing area of Main Stage, dedicated restroom facilities, and a VIP-only commemorative laminate. The Houston Open Air Festival’s band lineup is just part of what audiences have to look forward to this year. There will also be a special food and drink experience for fans who attend. This includes the Jack Daniel’s Old No. 7 Whiskey Row and a massive Gourmet Man Food Experience The brands featured in the Jack Daniel’s Old No. 7 Whiskey Row include: Jack Daniel’s Black Label, Gentleman Jack, Jack Daniel’s Tennessee Honey, Jack Daniel’s Tennessee Fire, Old Forester, and Woodford Reserve. The complete lineup and menus for the Gourmet Man Food experience will be announced soon. Houston Open Air is produced by Danny Wimmer Presents, producer of: Louder Than Life, Chicago Open Air, Monster Energy Welcome To Rockville, Monster Energy Fort Rock, Monster Energy Aftershock, Monster Energy Carolina Rebellion, Northern Invasion, Monster Energy Rock Allegiance, Rock on the Range, and more. It is sponsored by: Monster Energy, Jack Daniel’s, El Jimador, Fxck Cancer’s Dyin2Live, NRG Park, and SoHo Concessions, and more to be announced soon. NRG Park is the home of the NFL’s Houston Texans and the annual Houston Livestock Show and Rodeo. It is located at One NRG Park in Houston, TX. 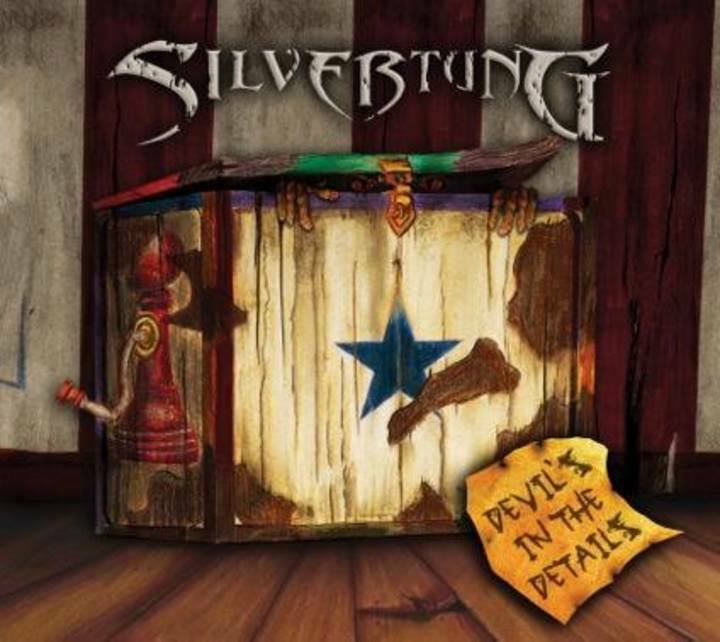 Courtesy: Chipster PR & Consulting, Inc.
Baltimore, Maryland’s own Silvertung will play a huge hometown show this summer. Up-and-coming hard rock four-piece Nothing More will kick off the new year with a pair of performances in North Carolina. Nothing More will open 2015 with a live performance Saturday, January 10th at Cat’s Cradle in Carrboro, North Carolina. The band, which is touring in support of its self-titled debut album, is serving as a support act to Periphery on that band’s 2015 “Juggernaut Tour.” It is joined by fellow support acts Wovenwar and Thank You Scientist. Tickets for the bands’ show at Cat’s Cradle are $18 to $22. Tickets are available online at http://www.ticketfly.com/purchase/event/717347?utm_medium=459899. Doors open at 6pm with the show starting at 6:30pm. After the bands’ show at the Cat’s Cradle, they will head on to Charlotte, North Carolina, where they will perform the next day, Sunday, January 11th at the city’s famed Fillmore. Those looking to attend the bands’ performance at The Fillmore can purchase tickets online via LiveNation at http://concerts.livenation.com/event/0E004D5ECA765781?dma_id=289&wt.mc_id=aff_BUYAT_97249&camefrom=CFC_BUYAT_97249&REFERRAL_ID=tmfeedbuyat97249. Tickets start at $27 each. Doors open at 7pm. Wovenwar will return to the road in 2015. Metal Blade Records and the members of Wovenwar announced this week that the band will kick off 2015 alongside Nothing More and Thank You Scientists! on the Juggernaut tour. 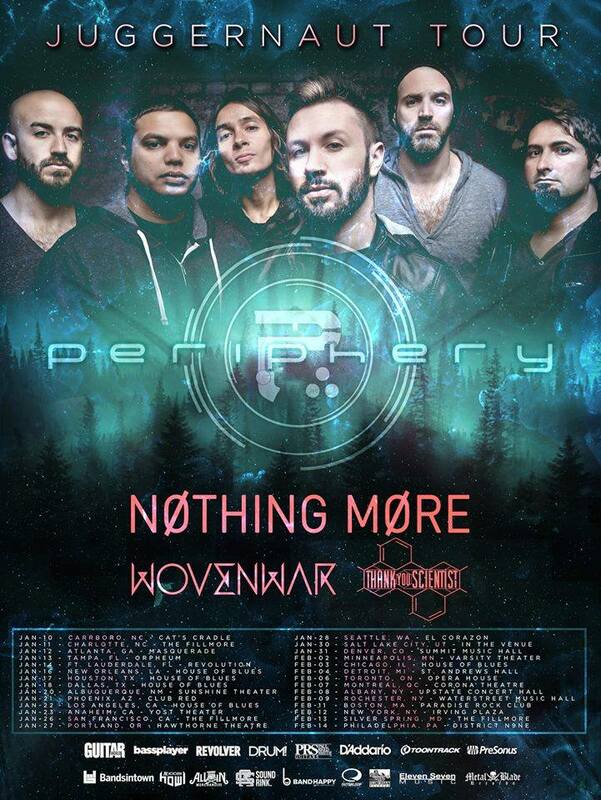 The bands will serve as support acts for headlining act Periphery. The tour kicks off Saturday, January 10th and will run for five weeks, ending February 14th in Philadelphia, PA. Tickets for the tour go on sale tomorrow, Friday, November 7th. VIP packages will be available online via Soundrink.com. Wovenwar is currently wrapping up the European leg of its tour in support of its self-titled debut record. That record is available now in stores and online. The last date for the European leg of the band’s tour will be this Saturday, November 8th in Goteborg, Sweden. After that, the band will take some much needed time off for the holidays, recharging and getting ready for the upcoming Juggernaut Tour. The complete schedule for the Juggernaut Tour is listed below. Tickets for the bands’ show at Cat’s Cradle are $18 to $22. Tickets are available online at http://www.ticketfly.com/purchase/event/717347?utm_medium=459899. Doors open at 6pm with the show starting at 6:30pm. Those looking to attend the bands’ performance at The Fillmore can purchase tickets online via LiveNation at http://concerts.livenation.com/event/0E004D5ECA765781?dma_id=289&wt.mc_id=aff_BUYAT_97249&camefrom=CFC_BUYAT_97249&REFERRAL_ID=tmfeedbuyat97249. Tickets start at $27 each. Doors open at 7pm.